F2 Non-Purple Stem, Yellow Green-Leaf variety of Wisconsin Fast Plants® is the offspring generation of intermating the F1 Non-Purple Stem, Yellow Green-Leaf. This stock (along with its F1 generation parents) demonstrates a two-gene inheritance model representative of Mendel’s findings. Unlike several of the Wisconsin Fast Plants heredity and inheritance varieties, the Yellow-Green Leaf phenotype is not observable when seedlings are germinated in a Petri dish on paper towels. 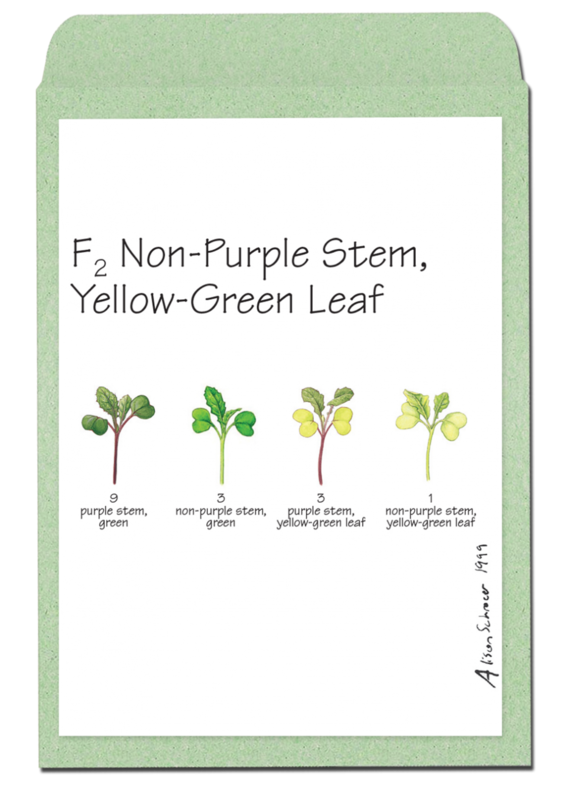 The F2 Non-Purple Stem, Yellow Green-Leaf should be grown in potting mix under the recommended growing conditions. Dihybrid Genetics: Two-gene inheritance studies with the F1 and F2 Non-Purple Stem and Yellow-Green Leaf varieties.